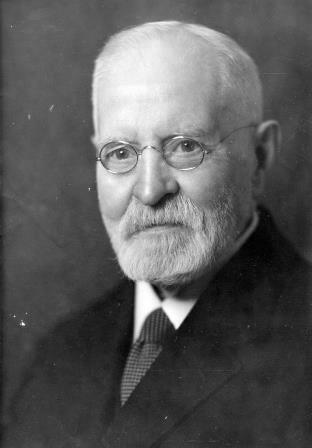 “Edward Hewetson Heaps, of the firm of E. H. Heaps & Company, is occupying a leading position as a lumber manufacturer of the province of British Columbia, being at the head of one of the enterprises that have in large measure contributed to the upbuilding, substantial growth and commercial advancement of the province. Mr. Heaps was born in Yorkshire, England, on the 26th of March, 1851. His father, Thomas Heaps, also of Yorkshire, was an architect and builder, a devoted adherent of the Methodist church, and for fifty years a local preacher. He lived to the age of eighty, and left behind him an example for sterling integrity, rigid uprightness and undeviating adherence to all that was pure and true. He was survived by his beloved wife for three years. There were five children of the marriage, all today occupying positions of respect and influence. Edward H. Heaps, the subject of this sketch, was the youngest of his father’s family. He was educated at the Egremont Academy, conducted by the Rev. Robert Love, and upon completion of his studies was apprenticed to the firm of Stead Brothers, cotton brokers, of Liverpool, with whom he remained seven years. By steady and unremitting application to his duties he earned the respect and confidence of his employers. The firm would willingly have retained his services and promotion was offered, but Mr. Heaps had decided to seek his fortunes in the new world. He remained in America for three years, learning the ways of the country, and engaging variously in farming, store keeping, and lumbering. At the end of this period he returned to England, when his marriage to Miss Anna Robinson, of Manchester, took place. For eleven years thereafter he resided in Manchester, carrying on a profitable business in the manufacture of cotton goods, a natural development of his seven years’ experience in the cotton trade. His health failing, and there now being a growing family of children with futures to provide for, Mr. Heaps again decided to try fortune in the new world. Heap’s Store and Hotel in Ruskin. This was the second store built in Ruskin (first was the Ruskin Co-op Society store in 1898). 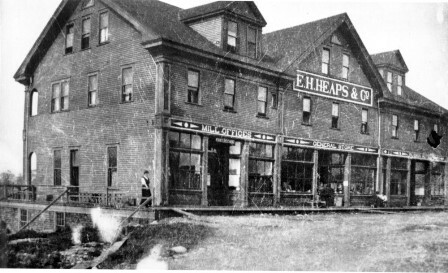 The E.H. Heaps and Co Store was built in 1902 and contained store, mill offices, and restaurant, until receivership took over in 1918. The building passed through several hands until destroyed by fire in the late 1920’s. The lady in the picture is Mrs. Moore, first storekeeper’s wife. The other person (difficult to see) is the general janitor and caretaker. Accordingly, in 1886, the family left England for America. Three years were spent in the eastern states and Canada, but believing that the great northwest offered still further business opportunities, Mr. Heaps in 1889 brought his family to British Columbia. In this province the lumber industry, with its wonderful future, attracted Mr. Heaps’ attention. Mr. Heaps had previously established a machinery and mill supply business, under the style of E. H. Heaps and Company. In the course of this business he again became interested in the manufacture of lumber and shingles. The company operates two plants, viz: Cedar Cove Mills in Vancouver, including a modern sawmill with a capacity of 100, 000 feet per day, large sash and door factory, also well equipped blacksmith and machine shops; and Ruskin Mills on the Fraser River at the mouth of Stave river, where the firm owns the town site, and operates saw, shingle, and planing mills, general store, etc. Shipments are made to the eastern and middle states, to all parts of Canada, and to foreign markets. Employment is furnished to between five and six hundred men. 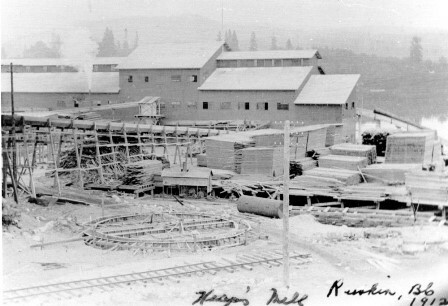 Heap’s mill complex from the west showing lumber piles and railway access. What appears to be a roundhouse or turntable is under construction at the front.